In a recent blog post, we previewed a few books included in our curriculum for the 2018-2019 school year. Among the books included are short stories and novels that feature characters and are written by people of color, members of the LGBTQ+ community, authors who deal with mental health issues, and have other diverse experiences. ADL is a nonprofit whose mission is to secure justice and fair treatment to all, including those of varying religions, races, genders, and identities. ADL posted an article outlining anti-biased education and how diversity in books was related. The article explains the difference between “mirror books” and “window books” when referring to diversity in children’s literature. A “mirror book” contains a reflection of oneself: your culture, gender, race, religion, etc. and enables the reader to potentially see themselves in a different light. On the other hand, a “window book” gives the reader a glance into another life that features different people, events, and places that they may not be familiar with. Exposing students to different environments through these “window books” is a unique opportunity to learn empathy and perspective, while allowing children to reflect on their experiences through “mirror” books helps them relate in new ways and learn more about themselves in the process. What Portion of Books are Considered Diverse Today? The Cooperative Children’s Book Center does a yearly study on how many books are published from non-white authors. Though there has been an increase in recent years for books published from multicultural authors, there are still just over 10% of books published in the last 24 years that were written by and about people of color. This is compared to the 2017 census data that reported 40% of Americans as people of color. Examining the books in the Young Adult LGBTQ category, where the characters or plot line focuses on LGBTQ issues, the percentage has doubled in the last decade. Malindo Lo, an author who writes about such issues, conducted her own study in 2017. Malindo counted books published each year by mainstream authors, reaching nearly 80 books in 2018, up from 55 in 2015. Comparing this to the 4.5% reported American LGBT population in 2017, there is a large variance between the population and the representation within publications and what students are exposed to. This under-representation is what a lot of advocacy groups and movements aim to address today. Is Diversity in Books an Important Topic Today? Yes! We Need Diverse Books aims to “produce and promote literature that reflects and honors the lives of all young people.” An 11 year old African-American girl, Marley Dias, launched the #1000BlackGirlBooks to bring awareness to the lack of diversity in contemporary books. Words Alive understands the importance of diversity as well and works hard to bring “window books” and “mirror books” into the classrooms to teach students self-reflection and empathy. Most of our participants are non-white students, a group that is severely underrepresented in American publications. By exposing students to different cultures and reliving how main characters have endured experiences that the reader may have gone through personally, we are able to bring more representation, tolerance, and understanding into the classroom. An image of our students from La Mesa Community School posed in front of their sculpture. One of the students is holding up a copy of the book, The Hate U Give. On June 8th, Words Alive held our 4th Annual Art & Literacy Event to showcase artwork made by our Adolescent Book Group (ABG) participants. Each year, ABG students participate in a program-wide literacy and arts project that enhances their reading experience and encourages them to think critically about themes in a book and their own environment. For many the term “risk” is a very positive or powerful way to go forth or evaluate next steps. Yet at the same time, we use the term “at-risk” with a child and I don’t need to define that even further because you know exactly what that is. At-risk kid. At-risk communities. They have very negative connotations. These are labels that very often these kids grow up with, I don’t know if they are trying to shed them, they will tell you sometimes it's who they are. But we look at risk very differently [depending on our perspective]. That was the inspiration for this...Through this duality we wanted to take a look at dual concepts but with language and having conversations about [this] one particular word. In the novel, The Hate U Give, the main character encounters and witnesses police brutality in her community and overcomes barriers through activism. For the exhibition, students focused on themes of duality in their own lives and how they have struggled and persevered individually. The project enabled the participants to make real-world connections between the book and their lives in a meaningful way in order to learn about themselves but also reflect on how coming together and sharing their experiences can make a larger impact. Each student painted an individual wood piece based on either the positive or negativw aspects associated with a particular theme. For example, students may have created work about the negatives of activism, or the positives of anger. Students painted individual pieces of wood based on a theme from the book (identity, racism, grief, anger, bravery, risk, or activism), then the pieces of artwork submitted by the students were combined together into communal sculptures by local artist Isaias Crow. In the end, each school participating in the project had a distinct sculpture that served as a visual representation of the positive and negative aspects (i.e. the “duality”) of one of the prominent themes in The Hate U Give. The exhibition, titled The Love You Give, was displayed at the San Diego Art Institute (SDAI), a regional contemporary art center in Balboa Park, at the Youth Alliance Exhibitions: a showcase of student artwork created during the past school year with seven other local non-profit organizations. In addition, two of our schools (La Mesa Community School and 37ECB) took field trips to view the exhibition. During these field trips, the Education Director from the San Diego Art Institute, Karla Centeno, held a discussion with the students about how they felt about their work being displayed and publically available for others to see. Responses ranged from “I feel famous” to “I feel proud” and Karla encouraged the students to bring their family and friends to view their accomplishments as well. that drowns in black water. Bravery is not about jumping in front of a bullet or standing up for someone. To me, bravery is avoiding confrontation and walking away. Bravery is not about getting locked up or committing a crime. Bravery is staying away from crime and moving on. Bravery is not always about fighting or jumping someone you hate. Bravery is breaking up a fight or doing what’s right. An image of the Words Alive program for The Love You Give next to the book cover for The Hate U Give. Words Alive Executive Director Patrick Stewart spoke at the event and called upon the experiences the participants have had throughout the program and during the art project specifically. He recited their words such as “this is the first book I’ve read” when speaking about a novel they studied, then later, “I can’t believe I actually wrote this” as they picked up the program that held their own poems. Providing the environment and tools that allow students to read, analyze, create, and learn to love reading is what Words Alive strives to accomplish with our Adolescent Book Group. One of the many ways we teach and inspire the students to do this is through the integration of literature and art, which studies have shown can expand critical thinking and language development. We are so proud of our students for creating such beautiful art pieces and engaging with the project. We can’t wait until next year’s project! If you would like to learn about and get more involved with our literacy programs at Words Alive, click here to find out more information. Words Alive’s Adolescent Book Group has wrapped up for the school year, so we would like to take a deeper look at what the program entailed, our successes, and what the participating students had to say about it! An image of one of our Words Alive Westreich Scholarship students facilitating a book discussion at La Mesa Community School. What is the Adolescent Book Group? In 2018, our Adolescent Book Group (ABG) worked in 19 different classrooms that are within the Juvenile Court and Community School System. Across all classes, our participants read 41 books over the course of the school year. Our ABG Program works to achieve three main goals: help students develop an enduring commitment to reading, become life-long learners, and become an advocate for themselves and their futures. In order to develop a commitment to reading, students are exposed to books with inspiring and life-changing themes that they are able to analyze and discuss further with their peers, teachers, and Words Alive volunteers. In 2018, 80.24% of students agreed that ABG has helped them develop a positive attitude toward books while 85.19% of students agreed that ABG has helped their ability to express themselves in group discussions. Luis, a 17 year old high school student said, “I thought this program was very helpful to me and made me want to read more. I really never liked reading until I got out to a program like this.” Developing a positive attitude towards reading opens up countless opportunities to continue learning by either teaching yourself or motivating yourself to pursue higher education. Our participants are able to move towards the goal of becoming life-long learners because they are given the opportunity to learn and recognize their own ability to seek out information to solve problems, acquire critical thinking skills, and use the needed skills to successfully transition into a post-secondary education or a career after school. 8/8 teachers surveyed said ABG helped their students achieve the common core standards of determining and analyzing themes, analyzing the development of complex characters, propelling conversations by posing and responding to questions. In an environment that is very heavily influenced by a student’s performance in Common Core standards, this is an area important to address. A classroom teacher from one of our schools said, “The volunteers were well prepared and extremely helpful in moving the conversation forward, talking about their experiences and how they felt as they read the book. 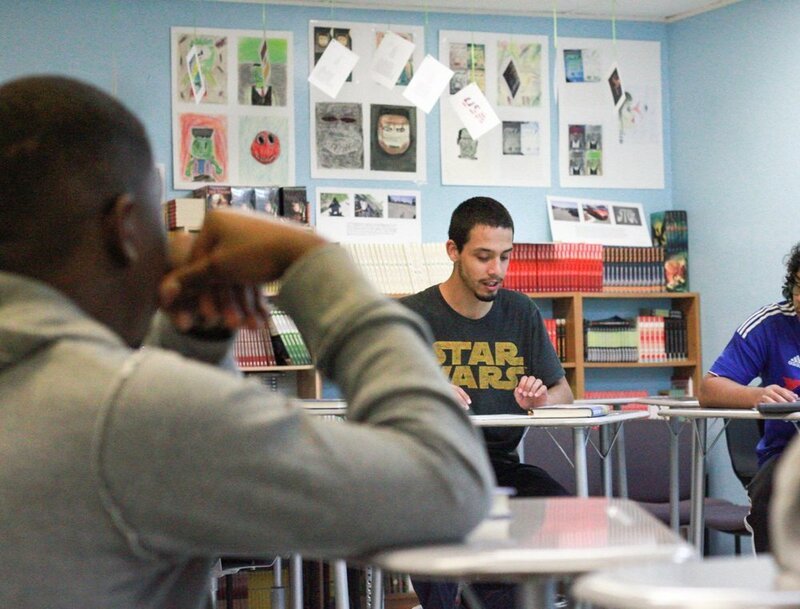 The behavior they modeled helped the students to discuss the topic from the perspective of their own experience.” Having additional positive role models in the classroom are also helpful for these teens as they near a turning point in their lives. Our last main goal, to help students become advocates for themselves and their futures, is obtained by not only increasing the participant’s self-confidence in the classroom but also learning their voice as a reader, writer, and a speaker as they work towards personal, educational, and career goals. 80.25% of students agreed that ABG has helped their ability to express themselves through writing and 83.75% of students agreed that ABG has helped their ability to make connections between what they read, their life, and their world. Jamie, a 15 year old who participated in our ABG program said, “I liked the creative writing because I had more stories than what I thought I had and I got a chance to show them to people.” Taylor, an 18 year old High School student said, “I liked the discussions because I was able to speak what was on my mind and put ideas in other students’ minds.” Having the confidence to share your ideas through written and spoken methods are important in becoming empowered to achieve your goals. An image of one of our students from 37ECB working on a black out poem. The image features a page of a book and the student's hand. Across all 11 schools we work with, we have achieved top results. As we look for further ways to improve our program, we will continue to follow up with our student participants, teachers, and volunteers for productive feedback. If you are interested in becoming a volunteer yourself or would like to find out more information about attending our Author’s Luncheon & Fundraiser to support programs such as our Adolescent Book Group, head to our main page here!